Nigel Benn fears Chris Eubank Jr will struggle to live up to the pressure associated with his famous name. 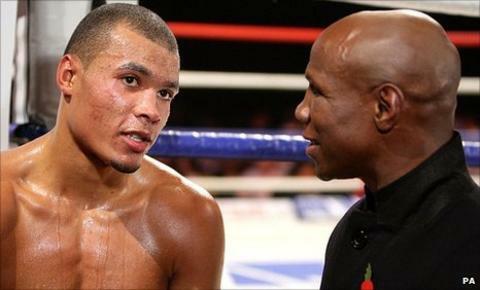 Eubank Jr stopped Lithuanian Kirilas Psonko inside four rounds on his professional debut in Manchester. But Benn, who fought two epic battles with Eubank Sr in the early 1990s, said the expectations on the young boxer would be difficult to shoulder. "It's very worrying because he has a lot to live up to," former two-weight world champion Benn told BBC Sport. Eubank Jr, 21, is starting out as a middleweight, the division in which his father was the WBO title-holder and never defeated. Eubank Jr entered the ring for his pro debut to Tina Turner's Simply The Best, which accompanied his father's ring-walks, even vaulting the ropes, also as his father used to do. But Benn added: "Chris [Sr] was a great fighter, so he's [Jr] going to have so much pressure on him. If he jumps into the ring like his dad and has the same music, then he better perform like his dad." After his victory over Psonko, Eubank Jr insisted he could emulate his father. He said: "I've got royal blood coursing through my veins. I can't help myself doing what my father did. "I want to be able to prove I can become the same or better than him. There's a lot to live up to but it makes me want to work harder to prove myself." Eubank Sr, widely regarded as one of Britain's greatest-ever fighters, claimed the WBO middleweight title with a ninth-round stoppage of arch-rival Benn in 1990. He subsequently won the WBO title at super-middleweight, although his victory was overshadowed by serious head injuries suffered by opponent Michael Watson in the fight. In 1993, Eubank drew a high-profile rematch against Benn and retired following defeats in five of his final nine fights - the last in July 1998 against Carl Thompson. "It's going to be a challenge for him, but praise God, I hope he does well," said Benn, who revealed earlier this year that his 15-year-old son also aspires to be a boxer. "Just look at the physique on him, he looked amazing - like father like son. I'll certainly be supporting him."